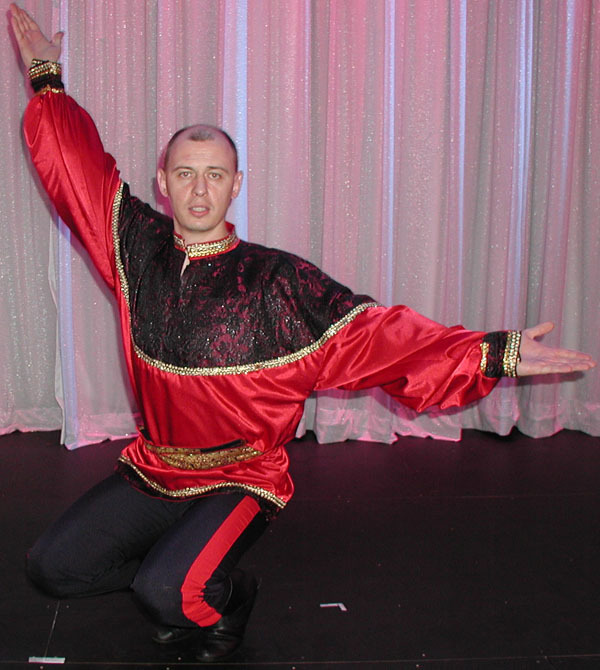 Russian dancer from New York Petr Tikhonov performs with Russian folk dance and music ensemble Barynya and Vitaly Verterich's Bottle Dancers USA. Cossack dance performance during basketball game NJ NETS vs Utah JAZZ at the Prudential Center arena in Newark, New Jersey, USA. ...This was an evening of Russian culture at the Prudential Arena in Newark, New Jersey (USA)... Dancers Alexey Maltsev, Petr Tikhonov, Vitaly Verterich, Ilia Pankratov, Danila Sherstobitov, Andrei Kisselev, Andrij Cybyk, Boulat Moukhametov have performed during a timeout during the game for over NJ NETS 10,000 fans. Olga Chpitalnaia from Brooklyn, New York. Mikhail Nesterenko from Brooklyn, New York. Ilia Pankratov from New York City. Alex Sizov choreographer from Brooklyn, NY.